My short story Visiting Orchids and a poem researched by Juthatip Trakarnsakdikul, a student of English Literature at Chang Mai, Thailand. 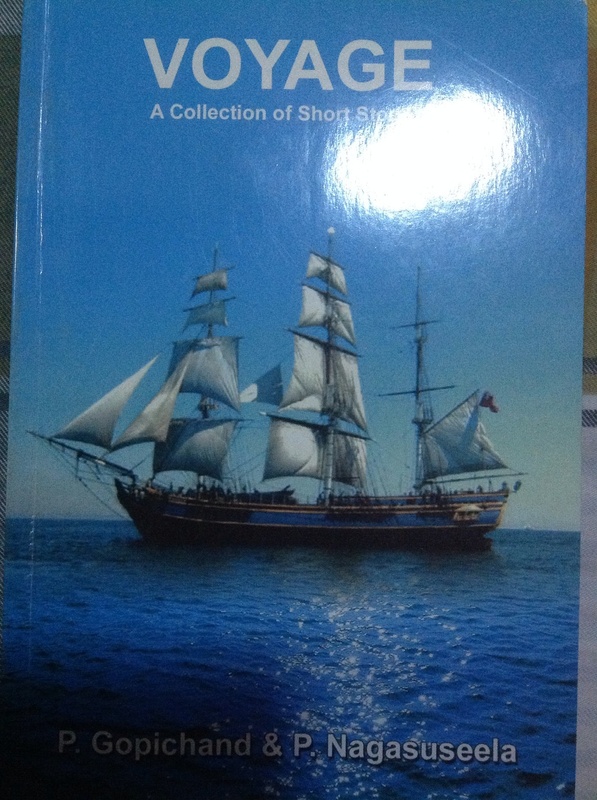 I must also share that although our researcher chanced upon the story at a website showcasing the work of Indian writers, the story found place in an anthology called Voyage published by dear Nagasuseela and Gopichand of Guntur University, Andhra Pradesh. More on the poem tomorrow...there is so much to share. I confirm that I have read and understood the Institute’s Code on Citing Sources and Avoidance of Plagiarism. I confirm that this assignment is all my own work and conforms to this Code. The poetess enjoyed writing and wrote until her blood blended with the ink on the page into her soul. Believing that kindness is the highest virtue, she has become a well-known poet of Asian Literature from India. Her name is Vinita Agrawal. I have done a little research about Vinita and found that while she is highly educated, she is very different from her highly educated peers who use their education for the pursuit of money. She follows her heart and takes pleasure in charity work, the care of animals, nature and gardening. From what I read about her, I knew she was a beautiful person. I contacted her through Facebook and asked her, "What makes you unique from others?" She replied, "Yes, I have always followed my heart and my heart is full of compassion. I believe that kindness is the best religion, one can follow. It is important to pursue one's dreams as that leads to true fulfillment in life." In every word and sentence of her reply I can feel her positivity toward life. Let's look at first passage from the short story, "Visiting Orchids. *4(pg.3) "He found himself at the same signal where he’d bought the purple orchids last evening. The lights were red again. He braked. A little boy ran up to him, his face eager, in his arms a bunch of roses and orchids and lilies. With a devastating sense of déjà vu he turned his face away from the sight." This part made me sure that these were flashbacks about his life, while he just observed without intention. He didn't do anything to resolve the problems with his lover and now it is too late for him because she is dead. *5(pg.3) "They pick them straight from the graves in the cemetery, they do. Crying shame, I say! To pick up flowers from graves and sell them! God bless the departed souls! It’s a cryin’ shame I tell you… Hey! You look awful! Are you all right? " And, "All right? Was he all right? Would he ever again be all right? Oh God! He hadn’t known this macabre truth behind the flowers sold here." The realization that the flowers offered for sale were stolen from the graves in the local cemetery poses some ethical questions to be considered. We can compare the actions of the girls and boys selling flowers to that of adults in contemporary society. There are unethical people who pretend to be good but have bad intentions and actions like the children in the story who sell flowers, which they took from the graves of the dead. The symbology of buying flowers for the dead is sincerity and honesty. The act of stealing these offerings which have been given respectfully to the dead seems repugnant until one realizes that these poor children have no other way to survive in a cruel society where they cannot afford an education to improve their lives. On the one hand the actions of the children seem cold and uncaring. The children who are so poor will stoop to any level of immorality just to earn money and satisfy their hunger. It's a part of the reality of our society. Their act is distasteful but the justification behind it is very sad and heart rending, but on the other hand what good are the flowers to the dead once they have been offered? These passages teach us to have compassion and look deeper into a situation for a fuller understanding. Might the dead be happy that the flowers given sincerely are used to help the poor and suffering in this lifetime? Another point of the story is that if you really want something you have to start now no matter what. You have to be brave and realize that no one can be with you forever and that the ones you loved are still with you in your heart. Carry on and make your dreams come true. Learning from your mistakes will guide you to greater happiness. *2 (pg.1) "Even speak to her parents if it was necessary, they probably still hadn’t forgiven him for hurting their daughter." *3 (pg.3) "... did Ria’s folks hate him so much that they wouldn’t let him attend her funeral? It certainly looked that way." Both passages teach us that we shouldn't worry about others that much because there are too many people in this world. If you want to do something, don't hesitate because of others, just start do it and believe in yourself. The situation at Bandra Cemetery shows us two things: the inequality of society which forces children to steal flowers from the grave in order to survive and the problem of today's society, so audience can imagine the picture and tell themselves to not let time become useless. Now let us analyze Vinita's Poem, "Poetry Prism." This poem explains that it is a great experience to explore and ponder the deep meaning of the poetry. The poet gives us a puzzle as our guide, but it is up to us to discover the true meaning. Rather, it is silent and anemic like the soundless tired fall of an autumn leaf"
This excerpt explains that poetry is a valuable thing and not superficial nonsense shouted out at the top of your lungs. The poet suggests that we read thoughtfully, for every word is carefully chosen and will reveal its meaning to those who listen with their hearts. And it oozes fresh blood always"
In this excerpt, the poet explains that casual browsing will not give you the inner meaning that lies underneath. She compares the words to a wound beneath a scab. From the outside, the scab looks dead, lifeless. Underneath, there is an active wound ready to gush forth. She encourages readers to pick at the scab, which means going beyond the words for the underlying meaning. You have to observer carefully, then you will be able to understand the deep essence in it. Here she compares the comprehension of poetry with a lost scent which is elusive. Poetry is figurative. The literal meaning is insignificant. You need to discover the meaning yourself, no one can explain it to you—it's personal. The meaning is unique to the reader. Bursting into a rainbow, when up against the sun"
Finding the meaning or value of a poem is like digging for treasure. You have to put in the effort to 'dig' for the underlying meaning. If you find the treasure (meaning), this comprehension may be of great worth, giving the reader greater insight into the deeper aspects of life. This passage, "the seven dyes of white light, bursting into a rainbow, when up against the sun," refers to the seven colors of the rainbow, which appear after the rain. Rain may be an obstacle, but if you face it and persevere, you will be able to experience the beauty of the rainbow. It is the same for poetry. If you challenge yourself to look beyond the literal meaning (white light), you will be able to see the rainbow, which represents all the elements of the whole. Life is complex like the colors of the rainbow. Vinita uses simple words which are easy to understand but which convey a deeper meaning. She uses everyday things such as mouthpiece or white piano keys symbolically to impart meaning, which is universally understood. She encourages her reader to use their hearts rather than their eyes to understand the greater meaning. Concluding on a personal note, after reading Vinita's works, I have a greater conviction to look at all aspects of my life with a deeper curiosity, searching for the deeper meaning which will provide me a fuller understanding and appreciation for life. If we all can learn something from her poetry, even the smallest thing, we can contribute to making the world a cozier place. Newer PostWhat Good Are Flowers To The Dead?